With its ability to deliver beautiful bokeh and exceptional sharpness even at maximum aperture, the Nikon AF-S Nikkor 24-70mm f/2.8G ED Lens is a great choice for serious photographers. 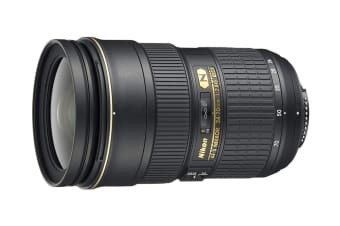 The Nikon AF-S Nikkor 24-70mm f/2.8G ED Lens allows you to capture photos and HD videos with superior quality. With its fixed f/2.8 aperture, it delivers fast focusing, enhanced low-light performance and superior resolution at any distance. Featuring unparalleled craftsmanship in engineering and optics, the AF-S Nikkor 24-70mm f/2.8G ED renders astonishingly life-like depictions of three-dimensional objects. The f/2.8 fixed aperture across the entire range allows for superior low-light performance and consistent exposure in any situation. Complementing this are 3 Precision Glass Mould Aspherical lens elements, which eliminate chromatic aberrations even at its widest aperture setting. This versatile lens is designed to maximise the performance of FX- and DX- format DSLRs. The Nano Crystal Coat eliminates ghosting and flare, while 3 Extra-low Dispersion glass elements enhance the flow of light through the lens ensuring excellent contrast, colour and sharpness in any lighting and at any distance. Impeccable focus is achieved through a Silent Wave Motor (SWM), which quickly locks on to your subject so you always catch the moment. The rugged and slim body offers professional-grade dust and moisture resistance, making it perfect for capturing the magnificence of the great outdoors.